When death threats closed Pittsburgh’s controversial Conflict Kitchen, public outcry helped the restaurant reopen and continue its mission. very city, especially in the Rust Belt, has that storefront or 20 where nothing seems to stay open. I’ve seen some great places in Pittsburgh, Pennsylvania, flicker on and off like a dying light bulb at the corner of S. Highland Avenue and Baum Boulevard, but with Conflict Kitchen that’s their design. They periodically change their menu, decor, events, and napkins to reflect a different nation with which the United States is in conflict. So far they’ve covered Afghanistan, Cuba, Venezuela, North Korea, and are currently serving Palestinian cuisine. Since opening, they’ve moved to the college-centered neighborhood of Oakland, in a park setting alongside a carousel, waffle vendor, and other light fare — though their content is anything but. Each change of menu focus brings along a new opportunity for dialogue, with vendors educated and interested in striking up a conversation about the nation du jour and speakers from in-conflict regions giving various presentations. Even the wrappers are stylishly displayed with quotes from both citizens and ex-pats about what it’s like living in those nations, ranging from love and travel, to settlements and resistance. As Pittsburgh slowly makes its way up the food chain of livable cities, it’s been graced with a growing number of ethnic eateries that pull this charming mill town out of its french-fries-and-pierogi haze, and Conflict Kitchen is at the top of the list of places that serve authentic international cuisine. Unfortunately, the black cloud that hovered over the city for so long from coke plants and steel mills has been replaced by the gloomier pollutant of cultural intolerance. The Israel-Palestine conflict is one that touches the lives of many, including the loved ones of the 42 people, both Israeli and Palestinian, who died in 2013 as a result of the turmoil. The neighborhood of Squirrel Hill, just up the road, has a vibrant Jewish community. The community, which is as diverse as any and ranges from Reformed to Orthodox to Hassidic, Ashkenazim and Israeli, is very divided on the issue, which, like all topics in American news, has become a largely partisan issue between liberals and conservatives. B’nai B’rith International sent Conflict Kitchen a formal letter expressing their concern over the choice of Palestine, insisting there be Israeli representation to lend a balanced voice to the subject. When Conflict Kitchen denied this request (specifically because it goes against the business model, as we are not in conflict with Israel; however, many Israelis have spoken freely at Conflict Kitchen events), B’nai B’rith reached out to The Heinz Endowments to request they rescind their $50,000 grant to the restaurant. The Heinz Endowments first responded by noting the grant was issued in 2013, but that they specifically do not support the current Palestinian menu and themed wrappers. That response has since been removed from The Heinz Endowments’ website and replaced with a statement of freedom of expression in the arts. Conflict Kitchen’s true art is its ability to create a dialogue around a group of people whose lives we affect with our tax dollars and votes, putting the focus on their humanity. That they received an artistic grant is important. This small restaurant is the brain child of artists Jon Rubin and Dawn Weleski, previously known locally for their Waffle Shop, located next door to the former location of Conflict Kitchen. 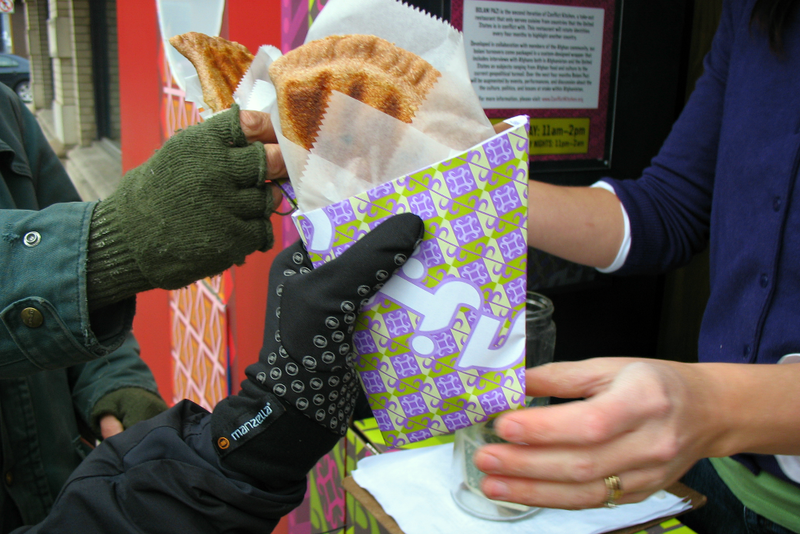 The premise of the Waffle Shop was similar to that of Conflict Kitchen at its heart: to bring people from the community together with conversations that ordinarily might not occur between strangers. With the Waffle Shop, the design was a late-night waffle diner and talk show platform where patrons had the opportunity to be interviewed (and broadcast on outward-facing televisions). Just like Conflict Kitchen, the food was a utensil for creating dialog, but never a back burner thought. Great care has always been put into these hybrid art installment restaurants. The difference now is that things are getting political and, as great art does, pressing buttons. 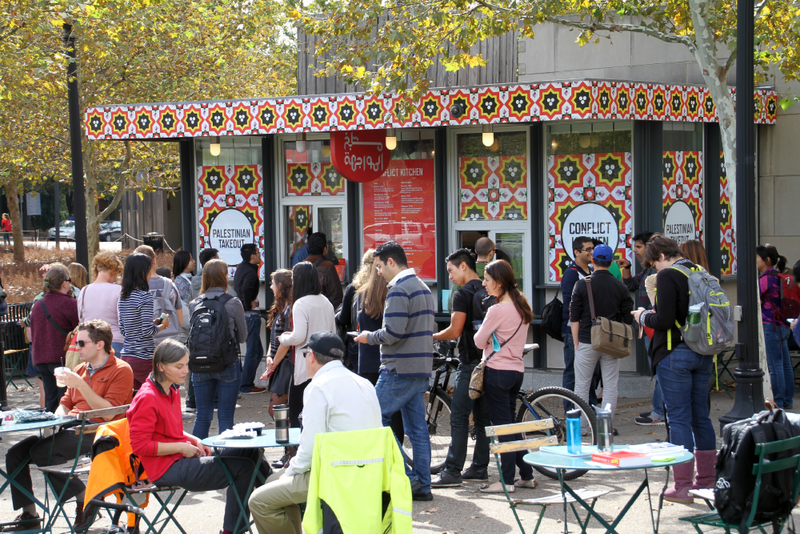 Things came to a boil when Conflict Kitchen received an anonymous death threat and was forced to temporarily close pending a police investigation. After an outcry of community support (including a statement from B’nai B’rith), the restaurant reopened its doors, though the investigation is ongoing. Those in opposition take special issue with the wrappers, citing the printed text as being inherently anti-Israel and anti-Semitic. At most, the wrappers express the hardships experienced as a result of the conflict, such as the inability to fish and poor access to schools, as well as anger at the Palestinian Authority. Each featured nation has had a similar wrapper. There was no outcry from South Korean, Chinese, or Japanese Pittsburghers when Conflict Kitchen served the South Korean version of the tiny candies given out in North Korea on Kim Jong-Un’s birthday. While the reasons we are in conflict are certainly different, the issue remains that a restaurant art project received death threats for featuring food from a community we’ve demonized, as Americans have a long history of doing. The larger issue at hand is the quieting of discourse and pressure to silence a voice, specifically through more threats of violence but also through biased news coverage that dehumanizes both Palestinians and Israelis by taking away their agency. An embarrassing luxury we have as Americans is that while our brothers, sisters, children, and neighbors may be dying at war, or may come home with disabilities both seen and invisible, we’re not surrounded by the shells of our bullets and our hospitals, by the uniforms and weaponry of those who wish us dead or whom we’re killing, the roadblocks that separate us from food and water, or the constant fear of terrorists eradicating our homes and history. Despite the phenomenal and fast cuisine, Conflict Kitchen’s true art is its ability to create a dialogue around a group of people whose lives we affect with our tax dollars and votes, putting the focus on their humanity. Most of our information comes to us through a screen, filtering out the beautifully mundane habits that make our political enemies human, that make them familiar. With each nation of focus, Conflict Kitchen visits the area, meets with strangers on the streets, asks to cook alongside the chefs of local restaurants, and are invited into the homes and yards of people in the community. As American travelers visiting places that rarely see a U.S. passport, they realize they are ambassadors, and spend most of their time listening and being appreciative of the communities that welcome them, as they’ve so far all done — especially, it was noted, Palestine. This attention to the individual is noticed in these communities. Israelis and Palestinians from Pittsburgh and around the world have called and written to thank the restaurant for finally giving them a voice in this conversation after decades of news sources and politicians speaking for them. Strangers are coming together to ask where Palestine is on a map, who Palestinians are, and why the U.S. is involved in this conflict. A goal of the restaurant is to break down the reinforced discussions that have been happening for decades surrounding these places of conflict, discussions which refuse to cohabit with the voices of those most directly affected by the situation and by our involvement as a nation. Even as the restaurant pushes against those walls, the local media has fought to discredit the validity of such an effort. “The Palestinian thoughts and opinions that are detailed in the interviews are informed by their personal context, experiences, and histories,” reads their statement following insistence by the Pittsburgh Post Gazette and other media and lobbying groups that their content was anti-Israel. “… [To] cast their viewpoints as simply anti-Israel is to reinforce the simplest, most polarizing, and dehumanizing reading of their lives and perpetuates the silencing of their voices.” This goes for Israelis as well, who are more than their nationality, as I hope we all are. As individuals, we are all entitled to our own complex views that are entwined with our history, beliefs, and experiences. To speak for a group or to otherwise not let them speak for themselves, regardless of the intention, is a racist and degrading act that removes the individual. Throughout the United States, and perhaps the world, information is catered by our media suppliers, who have varying interests of their own dependent on their investors and agendas, and by our ability to pick and gorge on the slant of our choosing. The silencing of voices in which we are in opposition has become even easier with the advent of internet journalism and 24-hour news stations, where people can feel completely informed about world politics because of our access to information, but at the same time completely filter out the opinions that go against their already established views. Left or right, we have suctioned ourselves into vacuum chambers of like-minded storytellers. Research at University of Michigan proved that once we do interact with opposing points, whether opinion or absolute fact, as a culture we use that information to further validate our own — often incorrect — points. As this article from Boston.com points out, when “misinformed people, particularly political partisans, were exposed to corrected facts in news stories, they rarely changed their minds. In fact, they often became even more strongly set in their beliefs.” Facts do little to warm us, but a steaming bowl of maftoul and a personal narrative hopefully can. With great flavor, Conflict Kitchen invites members from the local community to pull up a kitchen chair and experience that which makes us human: hummus, which is as much a part of Palestinian cuisine as it is any other Middle Eastern palate; homestyle rumaniyya, a savory-tart stew of eggplant, lentils, and pomegranate; sweet namoura cake that tastes similar to gulab jamun but with a texture similar to cornbread of the American South. These foods, served in to-go containers to be eaten in the now-wintry park, often enveloped in the wrappers that are, in themselves, such a point of conflict, also serve with them the ability to ask questions, to talk with strangers while getting a fairly priced meal. The wonderful thing is, strangers do engage. Even with this storm of events, this circus created by a few loud voices, strangers are coming together, lining up outside the take-out window to collect their food and change, to ask questions about where Palestine is on a map, who Palestinians are, and why the U.S. is involved in this conflict. Hard questions to answer, but sometimes even harder to ask. The price of the wrapper is a $7 falafel and a small take-out restaurant’s right to serve it. The price is the peace of mind of Conflict Kitchen’s staff in the form of a death threat that has yet to be traced to a source. The price is the safety of a minority to speak freely in the United States, even about non-political topics, and expressively without fear of condemnation. The price of the wrapper is also, however, in the broadening coverage of the topic, and in the support of the city over this dark incident. Despite media insistence that Conflict Kitchen has been shutting out the voices of the Israeli people, Israelis have come to events and talks, have been handed the mic, and have given their perspective. Sometimes people are made uncomfortable by something someone else has to say, regardless of who is saying it, but that’s the point. It’s okay to ask those uncomfortable questions, and we should be safe to speak our uncomfortable perspectives, regardless of what they are. That’s art. I stopped by Conflict Kitchen on the day they reopened to get some lunch and show my support. The small building is completely plastered with small notes of support, including one that says, “I’m pro-Israel, not anti-Palestine. Food builds bridges and keeps us all alive! Shalom Salaam Peace.” This is the dialogue that starts when people remember that political borders are not the outlines of our human shapes. We are constructed not of treaties and declarations and militarized zones, but of family history, recipes passed down across the kitchen table, traditions learned from the things with which we make do. If humans are going to stand a chance, these are the things we need to hold dear and cultivate, not just within our own families, but in our communities. And community is only as narrow as we accept it to be. Easy for me to say in Pittsburgh, but saying it is a start. Photos courtesy of Conflict Kitchen. Carolyne Whelan holds an MFA from Chatham University. She was awarded a full fellowship to the Vermont Studio Center and was a Jan-Ai fellowship winner. Her chapbook The Glossary of Tania Aebi was published in 2011, and her full-length manuscript was a 2014 Four Way Books Intro Prize finalist. Her work has been featured in Sugar House, Pink Pangea, and Women’s Adventure’s. She is poetry editor for the Lime Hawk Literary Arts Collective and writes the wellness blog Lifting Weights at Midnight. Follow her on Twitter. What a wonderful, thoughtful article about a really fascinating place. I love the concept of the restaurant, and the dialogue it inspires. Thank you, Paige! One thing that I feel keeps well-meaning people from talking is their fear of saying the wrong thing, of insulting someone, or asking a question for which they should already have an answer. But that isn’t what moves us forward, and neither is shutting that person out of the conversation entirely. Thank you for writing about this place. You made me want to go there and experience it in person. “Food builds bridges and keeps us all alive.” That’s the truth. Love the concept of this restaurant. Natalie, if you are ever in Pittsburgh, look me up and we can go together. They will be doing Cuba again next, to pick up where they left off, and then likely a nation or region in Africa. Possibly my favorite lines in the whole piece: Left or right, we have suctioned ourselves into vacuum chambers of like-minded storytellers. Research at University of Michigan proved that once we do interact with opposing points, whether opinion or absolute fact, as a culture we use that information to further validate our own — often incorrect — points. As this article from Boston.com points out, when “misinformed people, particularly political partisans, were exposed to corrected facts in news stories, they rarely changed their minds. In fact, they often became even more strongly set in their beliefs.” Facts do little to warm us, but a steaming bowl of maftoul and a personal narrative hopefully can. I understand the complex grey area between art and politics here, and I say that the very fact that what they are doing with the Palestinian angle right now makes me a bit uncomfortable is my first indication that I need to take notice. If I lived closer, I’d shell out seven singles and pull up a chair. Powerful stuff, thank you. Thanks for those kind words, Deborah, and especially for letting this piece resonate with you. A lot of times good art— whether it’s poetry, music, a movie, or an installation project such as this— makes us uncomfortable as our brain struggles to realign our old way of seeing the world with the new vision that’s been presented. Not necessarily to change our view point, but to bring in additional information. I think that art is great for that ability, as if it has a secret code for getting past our conscious protective gates.